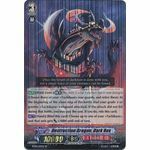 [CONT](VC) Limit Break 4 (This ability is active if you have four or more damage):During your turn, if the number of cards in your soul with "Dimensional Robo" in its card name is three or more, this unit gets [Power]+2000/[Critical]+1. 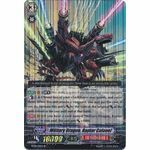 [CONT](VC/RC):If you have a non-<<Dimension Police>> vanguard or rear-guard, this unit gets [Power]-2000. [CONT](VC):If you have a card named "Super Dimensional Robo, Daiyusha" in your soul, this unit gets [Power]+2000. 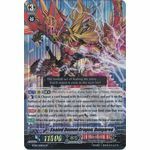 [ACT](VC) Limit Break 4 (This ability is active if you have four or more damage):[Counter Blast (2)] Choose one of your opponent's vanguard, and that unit gets [Power]-1000 for each of your <<Dimension Police>> rear-guards until end of turn. This ability cannot be used for the rest of that turn. 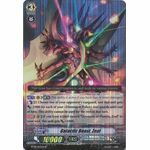 [CONT](VC) Limit Break 4 (This ability is active if you have four or more damage): All of your <<Neo Nectar>> get "[CONT](VC/RC): During your turn, if you have a unit with the same name as this unit on your (VC) or (RC), this unit gets [Power]+3000.". 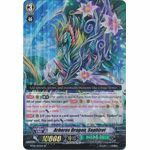 [CONT](VC): If you have a card named "Arboros Dragon, Timber" in your soul, this unit gets [Power]+1000. 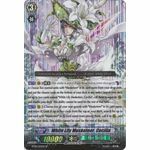 [ACT](VC) Limit Break 4 (This ability is active if you have four or more damage):[Counter Blast (1) & Choose five normal units with "Musketeer" in its card name from your drop zone, and put the chosen cards on the bottom of your deck in any order] Search your deck for up to two cards named "White Lily Musketeer, Cecilia", call them to separate (RC), and shuffle your deck. This ability cannot be used for the rest of that turn. [AUTO](VC) Limit Break 4 (This ability is active if you have four or more damage):When this unit attacks a vanguard, if it is the fourth battle of that turn or more, until end of that battle, this unit gets [Power]+5000 and "[AUTO](VC):[Counter Blast (1)] When this unit's attack hits, you may pay the cost. 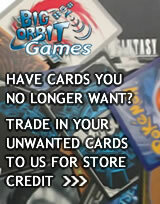 If you do, draw a card, choose one of your opponent's rear-guards, and retire it.". 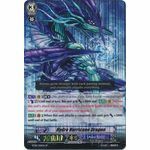 [CONT](VC/RC):If you have a non-<<Aqua Force>> vanguard or rear-guard, this unit gets [Power]-2000. 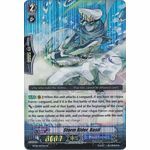 [ACT](VC) Limit Break 4 (This ability is active if you have four or more damage):[Counter Blast (1) & Choose a card bound with this card's effect, and put it on the bottom of the deck] Choose one of your opponent's rear-guards in the front row, and retire it. This ability cannot be used for the rest of that turn. 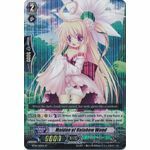 [CONT](VC/RC):If you do not have any cards in your bind zone that was bound with this card's effect, this unit gets [Power]-2000. [AUTO](VC/RC):[Counter Blast (2)] When this unit's attack hits, if you have a <<Dimension Police>> vanguard, you may pay the cost. If you do, draw a card. [AUTO](VC/RC):[Counter Blast (2)] When this unit's attack hits, if you have a <<Neo Nectar>> vanguard, you may pay the cost. If you do, draw a card. 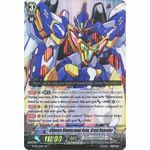 [AUTO](VC) Limit Break 4 (This ability is active if you have four or more damage):[Counter Blast (1) & Choose two of your <<Tachikaze>> rear-guards, and retire them] When this unit attacks a vanguard, you may pay the cost. If you do, increase this unit's [Power] by the sum of the original [Power] of the units retired as the cost until end of that battle. 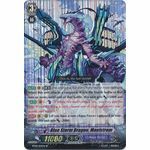 [CONT](VC):If you have a card named "Military Dragon, Raptor Captain" in your soul, this unit gets [Power]+1000. 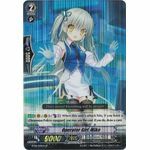 [AUTO](Bind zone) Limit Break 4 (This ability is active if you have four or more damage):[Choose three of your <<Tachikaze>> rear-guards, and retire them] At the beginning of the close step of the battle that your grade 3 or greater <<Tachikaze>> vanguard attacked, if the attack did not hit during that battle, you may pay the cost. 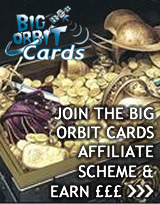 If you do, ride this card. [ACT](Hand):[Bind this card] Choose up to one of your <<Tachikaze>>, and that unit gets [Power]+3000 until end of turn.